Fork Parker’s Crunch Out is the latest game from Mega Cat Studios and is blasting its way onto a Super Nintendo near you! Mega Cat Studios has made a name for itself by bringing new and exciting adventures to classic consoles, breathing new life into old, dusty hardware. Yet, while Fork Parker continues this fine tradition, it also offers something completely unique. The game marks a collaboration between Mega Cat Studios, Devolver Digital (known for Hatoful Boyfriend and Absolver, among others), and Take This. For those who don’t know, Take This is a nonprofit organization whose mission is to raise awareness of and combat mental health issues. The organization has a particular focus on the gaming and game development community, yet its efforts support all those who are suffering. Devolver Digital is donating 100% of its profits from Fork Parker to Take This in an effort to support its mission. Players take the role of larger-than-life Devolver Digital CFO Fork Parker as he accepts the mission of kicking his company into gear to compete with a new rival indie publishing company that’s cutting into his profits. The game focuses on task management, questionable motivation practices, strategic spending of money, fun mini-games, and a whole lot more. It’s all done in a humorous, tongue-in-cheek manner (choosing between buying new fashionable shoes for Fork or a new espresso machine to boost employee morale), yet it still maintains a deeper meaning just below the surface. Being a game developer is a tough job with a lot of stress, and it can put a great burden on people’s mental health. 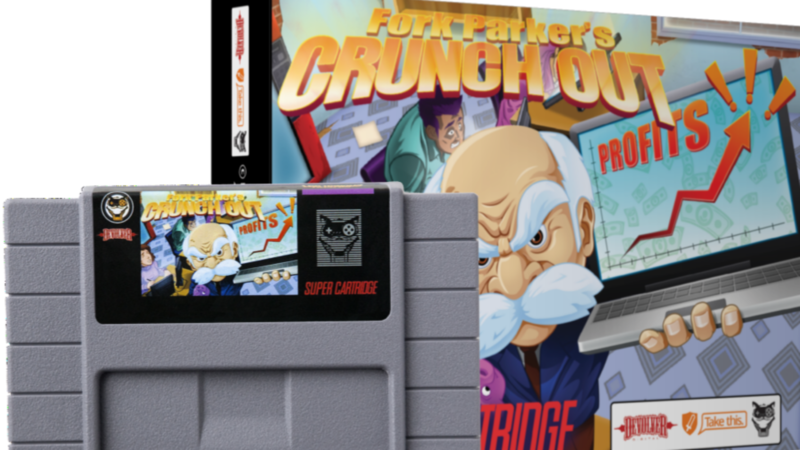 Like all other games from Mega Cat Studios, Fork Parker’s Crunch Out comes with an authentic-looking custom game box, an actual SNES cartridge that will run on actual console hardware, and even a physical instruction manual! So, those who are looking for a very authentic experience will love all the effort that Mega Cat Studios has gone through to give you something truly unique. What’s more, not only is the game available for the Super Nintendo, but there’s even a Super Famicom version! How neat is that?